Playtech slots are known for their fun themes and great payouts. With the new Funky Monkey slot, players can get started with amazing no deposit bonus and spin the reels for outstanding payouts. 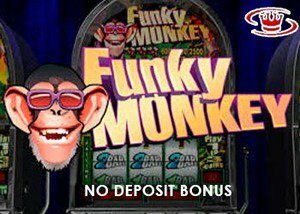 One of the best ways to start playing the new Funky Monkey slot is with a Playtech no deposit bonus at Vegas Red Casino. With this bonus, players can start playing for a chance to become a jackpot winner on the new Funky Monkey slot. This new game just hit Playtech casinos in May 2018 and it is a three reel classic slot that features a single payline. With the Funky Monkey slot, players can bet from just $0.15 per spin and they can boost the bet to a maximum of $15 per spin, so it is an affordable jackpot slot for just about every player that gambles online. As soon as players play Funky Monkey, they will see the entertaining monkey theme being depicted by some great game symbols. The reels will contain bars, bananas, tents, sunglasses and bongo drums and the top payout that can be earned from the game is a base game reward of 2500 coins when three coins have been bet on the payline. Unlike many other slot games that are featured at Playtech sites, this slot does not use any wilds or scatters, so all wins will be created with the standard icons that are listed on the pay table. The Funky Monkey slot game is a basic slot from Playtech and with just three reels and a single payline, it is an easy game to play. There are no wilds, no scatters and no bonus rounds that can be triggered. However, players can spin to win a progressive jackpot and will be eligible for the jackpot payout as long as they are betting three coins per spin. Get started with some great no deposit bonus offers and even free spin promotions that can be used in this great new game from Playtech.